Silent angel Vents have been scientifically designed to strengthen and expand the nasal passage, maximizing the air that flows in. This prevents the body from having any obstructions in the throat that cause the sound of snoring. Silent Angel is made with Soft medical grade FDA-approved silicone which is also BPA, Odourless, Flexible and Phthalate-free. This is a comfortable and easy solution to your snoring problems, and it is better than any Mouth Guard, Mouth Piece or Nasal strips. 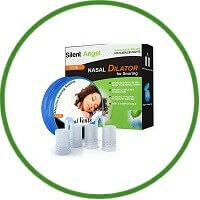 Silent Angel is the best anti snoring devices you will find.